Together with our friends Tribesports we are delighted to announce the launch of the parkrun performance range - a superb collection of technical sportswear that’s comfortable to run in and gives something back: as profits from the sale of the range are invested to ensure parkrun remains free forever, in hundreds of local communities around the world. The first item available is the short sleeve t-shirt based on the same cut as the popular milestone t-shirts. 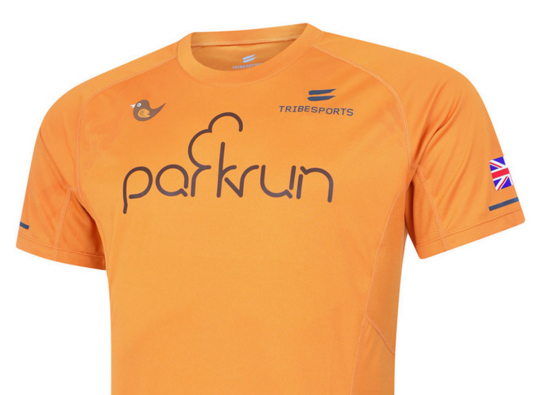 Presented in parkrun apricot and featuring a large parkrun logo on the front and the iconic parkrun scene on the back, the t-shirt is also customisable: we’ve responded to overwhelming feedback and for a little extra, parkrunners will be able to select their favourite event to feature beneath the logo on the front. 500 of these brand new t-shirts (250 men’s and 250 women’s) will be available for purchase from midday on Friday 5th February 2016 when links to order online via Tribesports will be published on our Facebook and Twitter pages. The performance t-shirts which come in male and female options and a full range of sizes, will be released in three further small deliveries in February and March ahead of the main launch in April. ‘Global’ and other country options will also be available soon. Over the coming months we will be adding to the performance range with items including a singlet, long-sleeved top, half-zip mid-layer and a jacket.